Ok, so some of you may have spotted that I have had a small break with my Pet Health Diary series but you will be pleased to note I am back. Despite the fact that I haven’t written a new part for the series for a while… well 2 months to be exactly… trust me when I say I would not neglect my pets in reality and skip their monthly health check, you have to believe me. Time to write about it later however is far less certain. According to the plan we should talk about skin, coat and nails in this post but instead I have decided to cover ticks and fleas… again. I am saying again as last year I posted a detailed post about these creatures – All you need to know about Ticks and Fleas. This post covers a lot of information and underlined the main difference between ticks and fleas. Today’s post was actually prompted by our recent trip to Europe. Ticks can be extremely dangerous, they can cause irritation, lead to an abscess and transmit diseases such as Lyme disease. Part of being a responsible pet owner is our duty to care for our furry babies, so don’t ignore the flea and ticks problem, protect your pet. Using FRONTLINE® Spot On on a regular basis will ensure that your dog or cat is cared for and will significant reduce any chances of them becoming more seriously ill through complications. 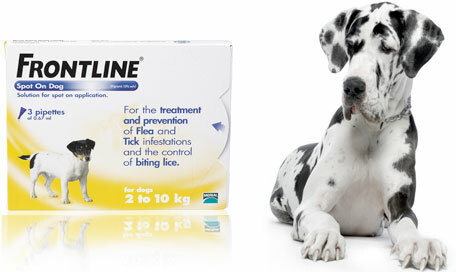 I am working with FRONTLINE® Spot On to spread the word about the necessity of tick and flea protection for pets but I wasn’t paid to write this post; I have however been using FRONTLINE® Spot On on all our pets for several years, way before I even started blogging and I truly believe that this is the best protection I can offer for all my furry friends. Have you ever experienced a flea or tick infestation? What do you use as a preventive measure? Ticks and fleas are a big problem for our four legged friends. So often I hear “Oh but my dog doesn’t have fleas, so no, I don’t use anything”. That’s just pure silly. The fact that a pet is flea or tick free today doesn’t mean it will be like this tomorrow. And believe me it is much easier to prevent the infestation than later trying to cure it. I found a brilliant table on Cesar’s Way website, which shows the main differences between ticks and fleas – have a look. Pull straight up. Don’t twist. Don’t squeeze (or pop!) the bloated belly. Wash the bite area and your hands. Mouth parts that remain rarely cause serious problems. But if you’re worried, call your vet. These diseases can have serious complications, so prompt treatment is essential. Tick-borne diseases are uncommon in cats, but they can get a tick infection called cytauxzoonosis, which is often fatal – so do your best to keep pests off your cat and out of your home. In addition to spreading diseases, ticks can cause other health problems in dogs, including: anemia, skin irritation or infection or tick paralysis. Fleas are much more common problem. Fleas rarely jump from one pet to another, as is often thought. Instead cats and dogs pick them up from infested environments. This could be your garden, the local park, a friend’s house – any place where an animal that has fleas, such as a rabbit, hedgehog, fox or another cat or dog, may be found. Most people think of fleas as a nuisance but they are much more than this. In addition to creating itchy spots they can carry diseases; the most popular being tapeworms. The worst part is that this doesn’t stop at pets; they can be transmitted into humans too. So, how to protect ourselves and our pets? The answer is simple: use a good quality preventive product to avoid the tick and fleas in the first place. We use Frontline Spot On; it kills fleas and ticks and controls biting lice on both cats and dogs. Frontline Spot On is Fast Acting: kills fleas within 24 hours and ticks within 48 hours; it is long lasting: kills fleas for up to 5 weeks in cats and up to 2 months in dogs as well as kills ticks for up to months in both cats and dogs; it is water resistant, which means that your pet can swim or be bathed as usual from 48 hours after application. Thing to remember: there is a lot of different products on the market but please whatever you choose always consult with your vet before picking any tick or flea treatment. Never use your dog treatment on your cat as this can be fatal. Never think your pet is safe from ticks or fleas because it simply isn’t true. Be a responsible pet owner and protect your furry babies! Is Your Pet The Pet Of All Pets? While Discovering a Pet Star! Pet owners all over the country will be submitting photos and videos of their pets this summer to the ‘Pets Will Be Pets’ campaign, created by FRONTLINE Spot On, in order to win the coveted Pet of all Pets title! The campaign, which will run throughout National Flea Awareness Month in June and throughout the summer, aims to raise awareness amongst pet owners on how to protect their pets from fleas and ticks so they can run explore, dig, lounge around and do what pets do best. And fleas multiply fast. Just one female flea can lay 50 eggs a day; so it can take as little as 21 days for one flea to become 1,000! Just one monthly treatment of FRONTLINE Spot On will help protect your pet from nastiest such as fleas and ticks and the ‘Pets Will Be Pets’ campaign highlights just how easy it is to protect pets as well as the home. Simply upload and share images and videos of the family pet to be in with the chance of winning. Closing date 29th August 2013. Roddy Webster, Head of UK Pets for Merial Comments: “This summer we wanted to bring some fun to the Pets Will Be Pets Campaign, while also raising awareness of a more serious issue – fleas. No one wants their pets to suffer from fleas, which is why we try and make it as easy as possible for pet owners to protect their pets with our FRONTLINE brand products. That way pets will look and feel their best – all in time to be entered into the Pets Will Be Pets competition”. For more information on fleas and how to treat them and to enter into the competition visit Hug Your Pet or follow Pets will be pets on Twitter. *Bond et al. A survey of flea infestation in cats and dogs in the UK during 2005. Veterinary Record (2007) 160, pg 505-506.